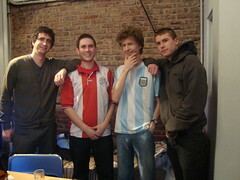 In a special edition of Hand Of Pod, Sam and the Dans are joined by Ralph Hannah, an English expert on Paraguayan football who was kind enough to drop in on us when visiting Buenos Aires with his wife for the weekend from Asunción. We discuss Paraguay’s chances in the forthcoming Copa América, who the key players in their team will be, and how the Paraguayan public are likely to view the tournament, as well as the amazing story of the side’s former star striker Salvador Cabañas, and his fight to return to normal life after being shot in the head early last year. We find the time to discuss Cerro Porteño’s chances of overturning their first leg defeat to Santos in the semi-final of the Copa Libertadores, as well. 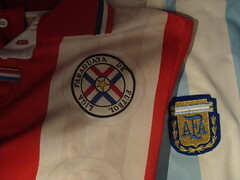 Hand Of Pod will be online as normal later in the week, discussing the Argentine league action with Seba. If you’re afraid you might miss it, don’t forget you can subscribe to us on iTunes.